Canada’s cool climate is not particularly friendly to most coldblooded reptiles. However, there are several species of turtles that have made this North American country their home. These turtles are mostly found along the streams, rivers and lakes of southern Canada, especially in the areas bordering the Great Lakes. Several species of marine turtles can also be found in the oceans and saltwater bays around Canada. Seven species of freshwater pond and marsh turtles are currently recorded in Canada. This group of turtles belonging to the family Emydidae includes mostly aquatic turtles as well as some terrestrial turtles like the eastern box turtle (Terrapene carolina) and wood turtle (Glyptemys insculpta). The aquatic members of this family include the spotted turtle (Clemmys guttata), which is Canada’s smallest species, the western pond turtle (Clemmys marmorata), the map turtle (Graptemys geographica), the painted turtle (Chrysemys picta) and Blanding’s turtle (Emydoidea blandingii). In Ontario, where the bulk of these turtle populations can be found, many of these species are considered to be at risk, according to Wildlife Preservation Canada. Canada is bordered by the Atlantic and Pacific oceans, and Canada's coasts are home to several species of marine turtles, though they do not nest on Canadian shores. Green turtles (Chelonia mydas) have been reported in the waters of the Pacific Ocean off the coast of Canada, while loggerhead turtles (Caretta caretta) and Atlantic ridley turtles (Lepidochelys kempi) can be found on the Atlantic Ocean side of the country. The world’s largest living turtle, the leatherback (Dermochelys coriacea), spends its summers in the saltwater off both Canada’s Atlantic and Pacific coasts. The stinkpot turtle (Sternotherus odoratus), also known as the musk turtle, is a member of the Kinosternidae family of mud and musk turtles. In Canada, this small turtle can be found only in the southern parts of Ontario, in slow-moving streams, lakes, marshes and ponds. When disturbed, the fragrantly named stinkpot can produce a skunk-like odor from musk glands near the bottom of its shell. The common snapping turtle (Chelydra serpentina) is the largest non-marine turtle currently making its habitat in Canada. This turtle can grow to shell lengths of more than 14 inches and can weigh up to 35 1/2 pounds. Common snapping turtles have a larger range in Canada than many other freshwater turtle species, though they remain in the southern parts of the country. Snapping turtles can be found in provinces ranging from Saskatchewan in the west to Nova Scotia in the east. A single species of softshell turtle resides in Canada, in a few locations in southwestern Ontario, in the Ottawa River region of the Quebec and Ontario border, and in two locations at Lake Erie. The spiny softshell (Apalone spinifera) gets its common name from a shell that is covered in leathery skin instead of a hard carapace. 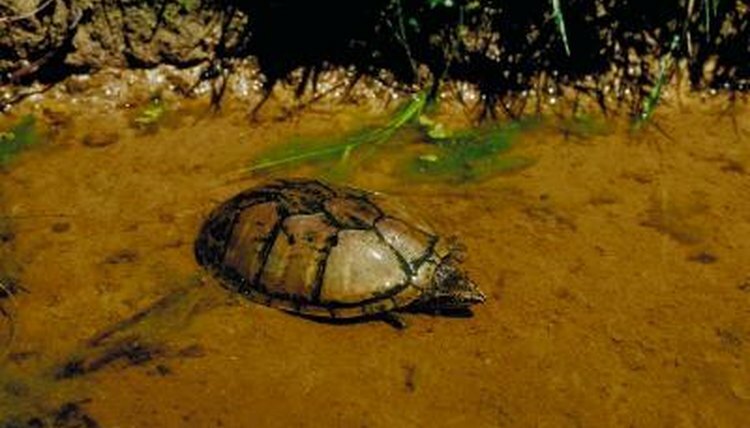 This species prefers slow-moving water with muddy or silty bottoms that they can bury into.